School’s out. With the abundance of online learning providers, Massive Open Online Courses (MOOCs), online universities, and so on, it’s clear that learning is no longer confined to the classroom. Despite our incessant demands for convenience, however, learning still takes time. For this, we have our old friend the learning curve to thank. Hermann Ebbinghaus, the German psychologist responsible for pioneering the study of memory, first described the learning curve in the late 19th century. The general idea is that the longer you put into learning something, the better you get – the “curve” describes your rate of progress on a graph of learning vs. experience. When learning a new instrument, for example, you might make pretty quick progress in the beginning – perhaps just one or two hours practice and you’ll be able to play a simple tune. As you become more proficient, things tend to slow down and the line flattens out. It may take you just a couple of years to reach 50 percent of your potential, but a lifetime to create your masterpiece. So, contrary to popular usage of the phrase, a “steep learning curve” refers to something which actually requires relatively little time to learn. What we want to do then, is steepen that curve. Apple tends to make a lot of noise about the educational potential of its new products, but they’ve been a little quiet on this one. That’s understandable: The small screen makes it perfect for previewing short messages, or telling the time, but not so great for longer or more complex content. It’s not going to have the same impact that the iPad had on traditional education. 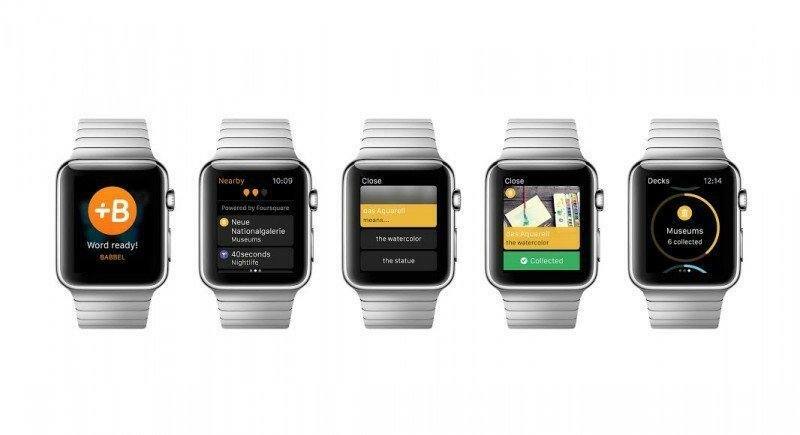 Despite these margins, the Apple Watch has enormous potential for learning applications. And, in many ways, it represents the birth of a brand new category of device that’s perfect for this purpose. That may seem unfair to existing products –Android Wear devices in particular–, but hear me out. We had handheld computers way back in the nineties. Lots of them had touch screens, but we didn’t think of them in the same way as we do tablets today. Smartphones too existed long before the iPhone came along, but the mantra of “mobile first” would have made little sense back when these devices were only seen clipped to the belts of the nerdiest among us. What the iPhone did for the smartphone, and the iPad did for the tablet, the Apple Watch is doing for wearables; they’re making them mainstream. That’s important. The problem with our existing mobile devices, as it turns out, is that they aren’t really mobile. Research shows that 68 percent of smartphone use is actually in the home, as is 80 percent of tablet use. As these portables’ functionality approaches that of a laptop, it seems, so too does their usage. That convergence won’t happen with wearables – at least for a while. With the Apple Watch’s release, developers have three legitimate categories of device to think about: desktop, mobile, and genuinely mobile. So why does any of this matter for learning? It’s all about context. We learn best when we learn in context. Like the learning curve, this is not a new idea. It’s why we had field trips in our school days and perhaps internships later – connecting what we’re learning to a real life situation helps the new information stick. That’s because the human brain is incredibly adept at storing material, but it’s also very efficient at filtering out and rejecting information that doesn’t seem relevant. Beating this filter is one way we can steepen the learning curve for a given skill. Take the earlier example of learning an instrument: if you read Saxophone For Beginners from cover to cover before picking up an actual saxophone, you’ll be lucky to play a note. Read it whilst you physically get to grips with the mechanics of playing the thing though, and you might be pleasantly surprised. The exact same content is far more effective when presented in its appropriate context. Context then, not the device, should be the primary factor that guides online learning products. That said, wearables like the Apple Watch offer developers some exciting new ways to make the most of contextual clues. Wearables exist in a different world than the devices on our desks and in our pockets. They’re always on, always visible, and always accessible. Most importantly, they’re unobtrusive: Whereas a smartphone offers a quick and convenient way to stop what you’re doing and access information, a contextually aware smartwatch application can serve up this information without interrupting you. Rather than presenting an alternative to whatever you’re engaging with in the real world, a smartwatch can present an additional layer of information simultaneously. The natural limits of a wristwatch-sized screen conveniently limit this info to easily digestible chunks. Imagine you’re learning Spanish; you could decide to learn about seafood and come across the word “pulpo” (octopus) in a list from a textbook. You might remember it in a week, then again you might not – it’s just a word on a page. Now consider a scenario in which you’re presented with the same word while engaged by the sights, sounds, and smells of a Spanish seafood restaurant. The associations are stronger, and the word is likely to be committed to memory much more effectively – thus the learning curve is steeper. If your day to day activities can be interspersed with these tiny opportunities to learn, it’s easy to see how a fairly extensive vocabulary could be built with relatively little time and effort. And it’s not just about locations. The challenge for developers is to gather and interpret all the relevant contextual clues. With time, learning to cook a new meal, tackling a DIY project, or holding a basic conversation in a foreign tongue could become as natural as glancing at your watch. When learning can truly integrate unobtrusively with our day to day problems of motivation and time-scarcity are easily overcome. In a traditional, content-based learning environment, the Apple Watch and similar devices have clear limitations, but for a new breed of self-motivated learner, it’s nothing short of a glimpse into the future.